The following is a list of national events that can be applied in your community. Brought to you by Points of Light, is an opportunity to recognize and thank volunteers who lend their time, talent, voice and support to causes they care about in their community. Fire Prevention Week has been observed on the Sunday through Saturday period in which October 9 falls. Introduce Fire Prevention Week to members of your community and remember to replace batteries in your smoke alarm. 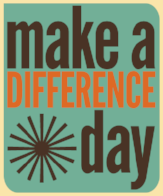 Make A Difference Day is one of the largest national days of community service. Celebrated on the fourth Saturday of October, thousands of volunteers unite in a common mission to improve the lives of others.